Agnes Nyinawumuntu, a former housemaid is today a model coffee farmer in Rukara, Kayonza District. Wageningen, the Netherlands — Women entrepreneurs are playing an important role in transforming global food security for economic growth, but they have to work twice as hard as men to succeed in agribusiness. "Agriculture and agribusiness are generally perceived as run by men," entrepreneur and Director of the Nairobi-based African Women in Agribusiness Network (AWAN) Beatrice Gakuba, told IPS. She noted that women entrepreneurs have to prove themselves, even though they are as capable and innovative as men. "Women entrepreneurs face more challenges in getting their foot in the door in agricultural business than men when it comes to access to finance because of several factors, including socio-cultural beliefs," adds Gakuba, who runs a flower export business. "The relationship between money and human beings has always been handled by men, so when a woman says 'I want to grow my business, or I want to get a loan', there are many questions asked. Women define agribusiness because more are employed in agriculture." Agriculture is an important source of livelihood for the poorest and is a way of eradicating extreme poverty, especially among rural women. According to the Food and Agriculture Organization of the United Nations (FAO), if women had the same access as men to resources such as information, land, improved technologies and credit facilities, they could increase agricultural yields by up to 30 percent, and lift more than 100 million people out of hunger. Given their contribution to agricultural development, how can women be empowered, and how can digitalisation in agriculture help to close the growing gender gap? These were some of the critical questions posed at a recent workshop hosted in Wageningen by the Technical Centre for Agricultural and Rural Cooperation (CTA). The workshop, organised this month around the theme of 'Making next generation agriculture work for women', explored concrete strategies for creating and improving women's opportunities in agriculture and agribusiness. The three-day event drew 40 participants from African, Caribbean and Pacific (ACP) countries working to advance women's position and performance in the agriculture sector. CTA Director Michael Hailu reflected on the question of how to ensure that women have a fair share of the benefits of agriculture and value addition. "In Africa, 68 percent of economically active women are in agriculture, but they get very little benefit from it," said Hailu, citing disparities between the amount of labour women invest in agriculture and the volume of their earnings. Being a woman entrepreneur in agribusiness comes with a catalogue of challenges, which include gender inequality, cultural and social barriers, limited markets, lack of land tenure, and skewed access to knowledge and information, finance and a range of productive assets. 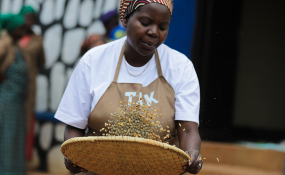 "Women put in more into agriculture, but get far less from it, and can do more with a little recognition of their innovation and knack for enterprise," said Sabdiyo Dido Bashuna, senior technical adviser for value chains and agribusiness at CTA. CTA recently launched VALUE4HER, a collaborative project with AWAN and the Africa Women Innovation and Entrepreneurship Forum (AWIEF), in an effort to help women develop agribusinesses and derive more income from agri-food markets. "We want to bring in more young women to be job creators and not just job seekers," said Irene Ochem, entrepreneur and CEO of AWIEF. "Women entrepreneurs face barriers of not having adequate management and business leadership skills, and we try to address these through networks." "It is important to recognise that culture is part of agriculture," said anthropologist Deborah Rubin, co-founder of Cultural Practice, a United States-based consulting firm working on gender in agriculture, health, evaluation and monitoring. "We have to look at the cultural context in the way in which production takes place. What is important is to see the cultural context as enabling rather than as an impediment," she added, warning against generalisation about the rigid roles of women and men in agriculture. Roles have changed over time in response to conditions in and outside the community, said Rubin. She stressed the need to focus on specific constraints faced by women in agriculture, in order to design the right interventions. "We have to look for things we can do immediately - either provide support, or change a discriminatory policy, or give access, for example for women to be able to cultivate land, not necessary ownership but to provide access," said Rubin. Researcher and development economist Cheryl Doss said the narrative about women and agricultural productivity should be reframed because narrow analyses have diverted focus from the bigger and more important question of how to target women for agricultural development interventions. In a 2017 research study, Doss cautions that gender‐blind approaches to designing interventions will miss key constraints, opportunities and impacts, because gender is embedded in the distribution of all resources for agriculture. Despite the challenges of entering and staying in agribusiness, change lies within women themselves: "Women empower themselves," said Rubin. "There is a role for policies and organisations to support the act of women empowering themselves, but in the end it is the women who have to take that responsibility, and who can act on it."